Your HUECU credit and debit cards are Apple Pay ready, so you can conveniently make purchases with compatible Apple devices. Apple Pay changes how you pay with breakthrough contactless payment technology and unique security features. Apple Pay is an easy, secure and private way to make purchases. Just hold your compatible Apple device near a participating merchant’s contactless reader. A vibration and beep let you know your payment has been accepted. 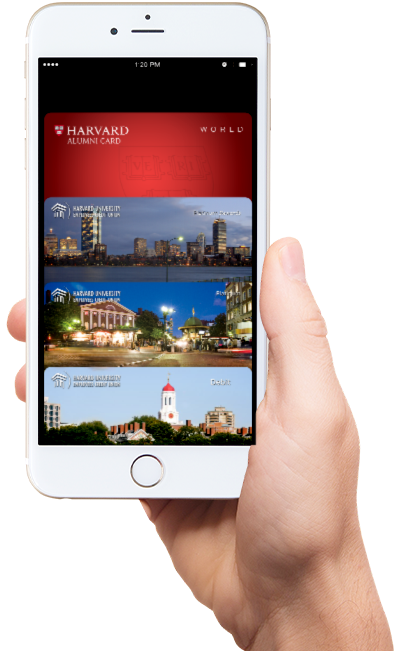 To add your HUECU credit or debit card, you need an iPhone 6 or iPhone 6 Plus with iOS 8.1 or later. Open the Passbook® app, swipe down and tap the plus sign. Use your iSight® camera to enter the card, or add it manually. The first card you add will automatically become your default payment card. You can go to Passbook anytime to pay with a different card and add or remove any of your cards as needed. Look for the contactless or Apple Pay symbol at checkout and hold your device near the contactless reader. Place your finger on the Touch ID™. Or, you may need to enter a passcode and sign a receipt. A vibration and beep indicates your payment was accepted. Making payments with Apple Pay is easy. The entire transaction is secure, as your credit and debit card numbers aren’t stored on the device or on Apple’s® server, so they’re never shared with the merchant. If your mobile device is ever lost or stolen, you can use the Find My iPhone feature to quickly set your device in Lost Mode, disabling purchasing ability and the ability to get into the phone without a PIN entry. Or, you can wipe all information from your iPhone.